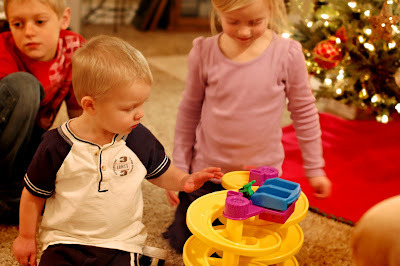 For Jaxon's birthday, we went to Grandma Miller's house, had cake and Ice Cream, and opened presents. He was so funny. He did help a little when it came to opening the presents, but when it was time to blow out the candles, he was so cute! We lit them, and then told him to blow them out (he does know how). He just stared at them, so Savannah showed him by blowing one out. He said, "Uh oh, Bi-yure! (fire)" And then pointed to the lighter because he wanted the candles lit. Thinking he wanted to blow them out himself, we relit them, but he just wanted to watch them burn. He did not want to blow them out, and didn't want anyone else to either. We finally had to blow them out for him. Jaxon loves his brothers and sister. All day long, he takes inventory of where everyone is. It goes something like this, "Where Dada? Dada erkin? (working)", then "Where Bason (Mason)? Ooks (school)?" "Where Nanna (Savannah), ooks?" , "Where Deeden (Jayden), "seepin (sleeping)? "Sometimes we even get Grandma (Bumm-ah), Grandpa (Bumpa), and Danna (which he actually says right) in there as well. He loves kisses. He loves cars (which he calls Brrrrrrroooomies,while he makes the brrrrooom sound that imitates a car). He loves his blankey. He teases the cat ceaselessly and has scratched up hands to prove it (but he never flinches when the cat cratches the heck out of him, he just laughs and evil little belly laugh). He loves to watch Super Why over and over and over. He is quite a daddy's boy at times. He loves to take a bath (blapth) or a shower (show) every time I change his diaper. He even tries to mother Jayden. He hates nursery, or anything that takes him away from mom for even a minute or two. He loves climbing, messing, breaking, throwing and screaming :) And I love him! So Happy Birthday my sweet little boy! I love you to pieces! Oh and for the record, yes, he did do with his cake the same thing he did with Savannah's cake (turn it upside down and break it up into pieces all over the kitchen when Mom wasn't looking), so we had to throw it out also. I can't believe it has been 2 years already! He's such a handsome guy! He is a doll! I love what you wrote about his personality. Ah! Happy Birthday Trouble!!! LOL! It's always the cute silent ones that are so sneaky! I know! I've got one! I love that he takes inventory too. Keller still cracks me up that he is always doing it. He just likes to know where everyone is. So funny. I finally found a difference between them though... I don't think Keller typically looks somber- he always has a mischevious twinkle in his eye even though he is not yet as mischevious as Jax. He's such a handsome little man!